Just got home from a fab, fun time with the fam. We’re a small clan. As my brother says, we could hold a family reunion in a phone booth. With spouses and kids, we might break 20. Speaking of the brother, in the spring he said, You occasionally exchange emails with Cousin 1; why don’t you ask her about getting together. She emailed back, That sounds good, and suggested meeting at her sister’s house. That covers the first cousins. Yes, we are a small clan. Cousin 2 rose to the challenge and we invaded her home on Sunday. Second Cousins 1 and 2, also sisters, joined in. My big effort for this get together was baking cookies and driving the farthest. Yes, I’m feeling a little guilty right now. . . And the hubs stayed home sick. *cough*really!! *cough*whatever*cough* But it was so good to see everyone, he wasn’t really missed. Sorry hubs, your loss. It may have been the heat, but I even enjoyed talking with Cousin 1’s husband. . .(insert winky emoticon here!!). Over the course of the afternoon, just about everyone’s phones came out to share pics — of children, of pets, of home remodeling, of celebrations, of hobbies — but nobody took pictures. We were too busy being in the moment. 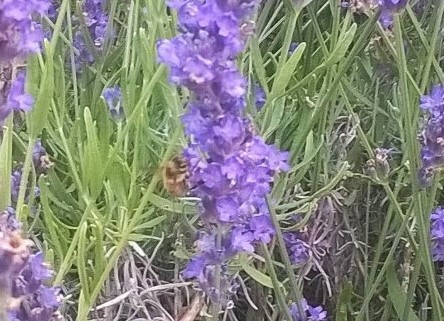 So these pictures are of my lovely lavender; more about that later. Cousin 1 and her hubs have put much effort into tracing their ancestry, and we are the lucky beneficiaries of her efforts: She presented each of us with a personalized tables of our lineage. The two of them have traveled around the Midwest and to Germany visiting and researching the places from whence we all came. (One German cousin contributed to the research and has practically joined the family.) Through the afternoon we added stories and details to fill in and expand on the well-researched facts. With more and more sharing about long-lost and long-gone relatives, the table figuratively got more and more crowded. We’re also not a tight-knit group. We stay in touch, but we’re really, emotionally speaking, arm’s-length Germans. So a rich and full discussion of family was deeply rewarding but a little out of our collective character. Of course, as we headed out, there was the chorus — We need to do this more often! Personally, I’m just very glad we did this, now. No need to put a weight on the future. Bits of the conversation played and replayed in my head as I drove home. And just as I was feeling quite content with who we are, the song Que Sera, Sera by Pink Martini began. The song isn’t a favorite, but in the moment it had me all teary-eyed driving down the highway. Can’t really say why that song pinpointed the feeling, but it did. I got so emotional I forgot to curse the guy in Impala who, for the fifth time, passed me and then slowed down. Really dude!! A brief shower started just as I pulled in the driveway. 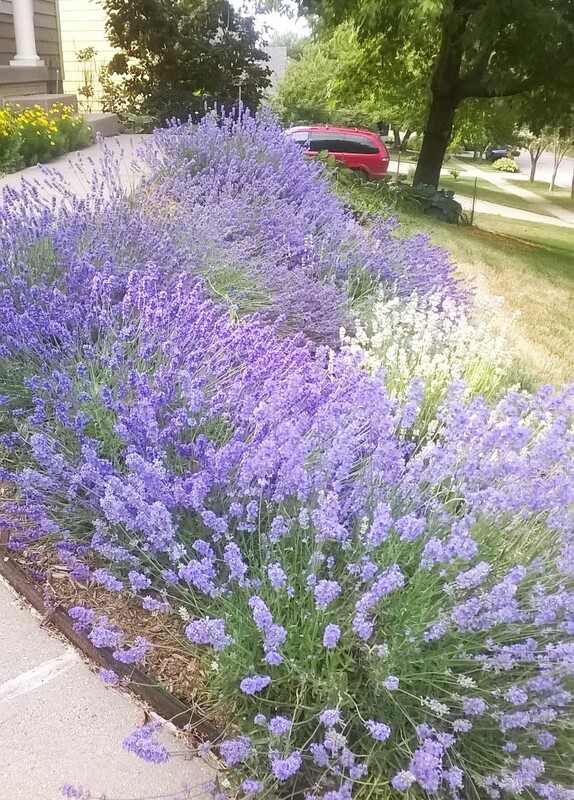 The rain removed the dust and sunshine that followed made the lavender amazingly vibrant. The modest effort I expended in the spring yielded brilliant results, the same way a brief email exchange lead to a lovely event. That makes me one happy little bee. genealogy work you’ve done. Amazing how much knowing a bit of our history affects one’s perspective. You’ve given all of us a wonderful gift, especially your daughters (even if they don’t know that just yet). 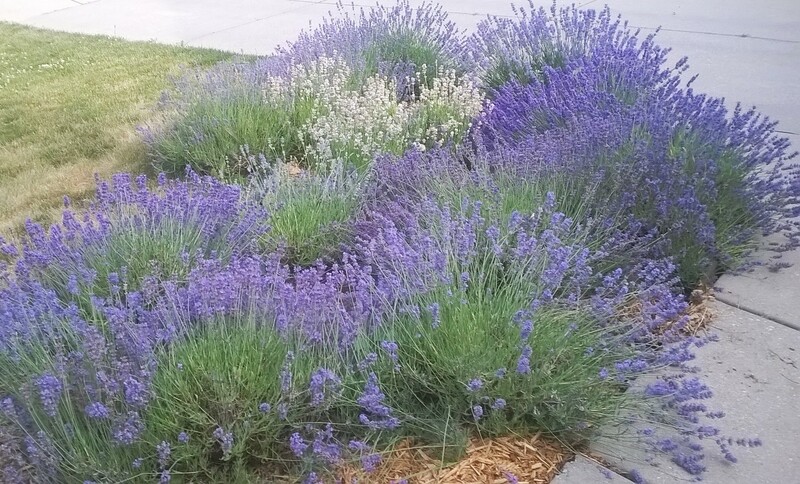 And my lavender is one of my great joys; glad it added some joy to your day as well.